Does anyone know who sells kayak trailers in the area? I would like to get something soon. Looking at Yakima RACKandROLL 66" Trailer and also open to any other ideas. Maybe someone could tell us what they have and like. 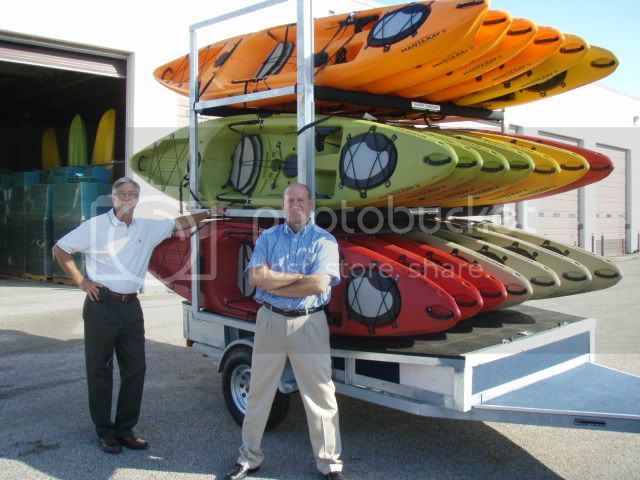 I have 2 Wilderness Pungo 120 Kayaks. They are 30" Wide and 12' Long. I am looking for the smallest trailer, something that can fold up and be put away in the winter. Looking to see where I can get one around here. I see Kittery Trading Post sells them and I can also get it mail order but I am looking to purchase it all put together and ready to go. I'm not sure why I just noticed this post but I was curious if you went with the 66" RacknRoll trailer. I bought one last year and it has been great! I am just tired of lifting them on the SUV. I can't wait to load the 2 kayaks on the trailer. What are you using on the top for racks? I have Thule collapsable J racks. I may sell them to carry the kayaks flat. I have 2 Wilderness Pungo's 12 foot. Both together will fit flat. How does it handle at 55 MPH? Can you see it backing up? Appreciate anything you could tell me. I can't wait to pick it up, Maybe Saturday! I will write back once I drive it around. Towing .... I pull the trailer with 2 different vehicles - a Honda CRV and an F150 pickup. I typically keep my speed between 60-65 mph. At this speed there is absolutely no swaying. As a matter of fact, you don't event know the trailer is behind you. Saddles .... I purchased my trailer online from OrsRacksDirect.com. At the time I purchased the trailer, I also ordered the Yakima EvenKeel saddles which have a universal mount designed to fit any shape bar (round, square, other). They didn't work on the round bars.... I started to notice that the saddles were losing their grip on the bar and slowly spreading apart (not a good thing). OrsRacksDirect was great and replaced the EvenKeels (at not cost) with the Yakima Mako Saddle - these have worked perfectly. I actually installed 2 safety poles (one on each side) to assist with backing up the trailer. The problem I have when towing it behind my truck is that, because of the size of the truck, I cannot see the trailer behind me (this is with 2 - 15.5' Kayaks loaded). As I start to turn, I can pick up the safety poles in my side view mirrors. This is not an issue when towing behind my CRV. However, I would still recommend the safety poles so other drivers can see your trailer on the road. Maintenance ... I put dielectric grease on the 4 pin electrical fittings - trailer and vehicle. Also, apply a little marine grease every now and then to axles and ball mount. Note ... my trailer shipped with a 1 7/8" ball mount. I recently learned that is should have shipped with a standard 2" ball mount. This is not a concern, however, if yours comes with the 1 7/8" mount, contact Yakima and they will ship the 2" free of charge. Thanks for all the information. Hope I can register it on Friday. I should be able to pick it up on Saturday. I have all Thule Racks now. Not sure how it will fit. I will put them on and see how it goes. I may sell them over the winter and mount the kayaks flat. There should be room. I did order the kick stand and spare tire but not the safety poles yet. I will get them from etrailer once I am ready to mount them. I also heard the same comment about the 2" hitch and the 1 7/8 hitch. My 4runner has a 2" setup. Thanks for the Maintenance tips, I will do the same for sure. I'll let you know what I decide to do with the racks. Hope I can just keep what I have. Can we mod the Yakima to do this? Only if I upgrade to 3 of the 78" RacknRolls and pull then in tandem! And to think I have trouble backing up the one I have now! Awesome, What did you do to the suspension? I know you can get a 300 lbs upgrade but your way over 300 lbs, your around 1200 lbs? Finally got the trailer home. The Thule racks when tightened still move around the round the yakima pole. I am thinking once the kayak is on and strapped down it could work but I am not very sure. Backing the trailer up is difficult but tomorrow I practice and Sunday put the trailer to use. I am using Thule Hull-a-port that I had on the roof of my SUV. They do twist a little around the Yakima round pole but I think when the kayak is strapped on it should be pretty stable. We'll see tomorrow.